There is nothing lke it in the world, this combination of holiday pagentry from Native American, Spanish, Mexican, American cultues intermingled with the imaginations of local artists. Unique hand-made arts and crafts, made by local artists. From hand-carved santos to traditional tin-work, great holiday gifts abound. Food & drinks, door prizes, gift wrapping. Lighting the Christmas Tree and Electric Light Parade on Taos Plaza - Taos Plaza transforms into a winter wonderland with local entertainment, appearances from Mr. and Mrs. Claus and the Grinch, complementary hot chocolate and cookies, and carolers. Lighting Ledoux - The historic narrow Ledoux Street glows with the light from farolitos, luminarias and bonfires. Galleries, shops, and museums are open, offering holiday food and drink. Join the Taos Community Chorus for their winter concert series, “Mexican Baroque: Exploring Our Past.” Guest conductor Ryan Allais and pianist Claire Detels lead the choir in an exploration of the music of 18th Century composer Ignacio de Jerusalem. December 12, 10am-7pm John Dunn Shops, Bent St.
Bonfires to warm you, snacks in the shops, music and events all day. Reception 4-7pm with farolitos and luminaries, food, music, Santa and more. Chamber music for flute, violin, cello and piano by Spanish composers rings in the holiday season with works by Enrique Granados, Joaquin Turina, Gaspar Cassado, Frederico Moreno Torroba and Antonio Rodil. Las Posadas – San Francisco de Asis Church in Ranchos de TaSan Francisco de Asis Church in Ranchos de Taos and different churches and parishes as well as private homes. A reenatment of the the Holy family seeing shelter. Las Pastores -- A free musical or "shepards play" is a morality story with abundant music performed all in Spanish. La Noche on Taos Plaza -- Santa will make an appearance; bon fires and Mexican hot cocoa. Christmas Eve Procession at Taos Pueblo -- Nowhere else on Earth can you experience this magical event. A stunning contrast between massive bonfires and the Procession of the Virgin with rifle salutes from the rooftops of the 1000 year old adobe pueblo buildings. A pageant of beauty, heritage, and awe inspiring imagery. Christmas Eve Torchlight Parades - Watch as skiers make their way down the mountain in the dark with flares as their only means of light. 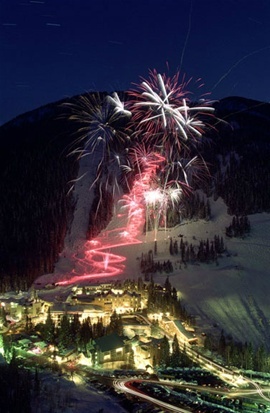 All the area ski resorts – Taos Ski Valley, Angel Fire, Sipapu, Enchanted Forest, and Red River – have torchlight parades and fireworks during the holiday season. Watch the trails of light as skiers with torches in hand glide down the famous Taos Ski Valley mountain under the starry skies. Firework displays light the winter sky in celebration of the new year. All the area ski resorts – Angel Fire, Sipapu, Enchanted Forest, and Red River – have torchlight parades and fireworks during the holiday season.